The Salisbury Bridge is a three-span, steel, Pratt through truss constructed in 1899 by the Hewett Bridge Company. It carries 690th Avenue over the North Fork of the Crow River approximately 3 miles west of Kingston in Meeker County. 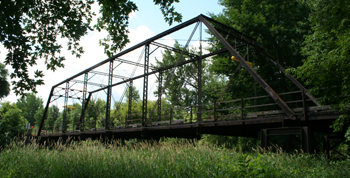 The bridge is significant as an early example of a steel truss bridge in Minnesota. single-span, Pratt through truss superstructure.